Please click here for information about a temporary traffic restriction. This coming Sunday July 5th - 10.30a.m. bring your favourite toy to St Mary's church for a short service to include songs, craft, refreshments and to help look for the missing sheep - whatever your age do join us ......... and don't forget your toy! Details of the closure and diversion route are shown on the attached map. All affected properties will be letter dropped and we will endeavour to maintain access to properties within the closure, however there may be times when access is restricted/delayed, and South West Highways would like to apologise in advance for any inconvenience caused by these essential works. If you have any queries please email, or call me on the number below. Culm Valley Young Farmers have had a very busy couple of months starting with a flower arranging class held at Kentisbeare Village Hall. The evening saw thirteen girls learn table decorations and buttonholes from Helen Williams and Laura Reed. Thanks to the Laura Persey Trust for their kind funding of the evening. Next Michelle Batting, Mark Snell, Charlie Cunningham and Gavin Jackson competed at East Devon Stockjudging Day – they had a successful day winning lots of prizes between them as well as the Overall Club Points Cup. A special well done to Gavin who won the Senior Points Cup. Members also competed at Devon YFCs Outdoor Activities Day with Brett Troake and Keiran Palfrey coming 1st in the Block Laying, Brett Troake coming 1st in the Clay Pidgeon Shooting, Gavin Jackson coming 1st in Senior Dairy Stockjudging and Michelle Batting coming 1st in the Intermediate Dairy Stockjudging. The Mens TOW came 1st and will be competing at the South West Area round in June while the Ladies TOW team came 3rd and the Junior TOW team came a close 2nd. On 8th May, the Club held their 68th Show and Sale at Exeter Market, the day was a great success with members of all ages taking part! Congratulations to James Westcott who won the Supreme Championship with his four Suffolk X ewes and lambs as well as to Charlotte Alfrod who won the Reserve Champion with her Limousin beef heifer. 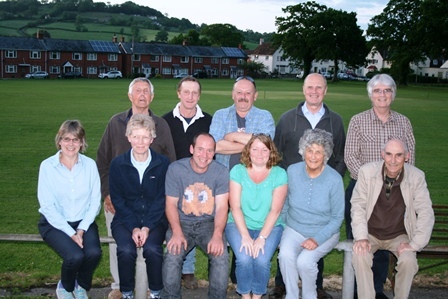 We have also been doing lots of promotion of the Club with James Westcott and Michelle Batting giving a talk at Hemyock Annual Parish Meeting and members attended Halberton Fete to promote the Club and raise money for the Exeter Leukaemia Fund. Coming up we are busy preparing for the Devon County Show where members will be exhibiting their stock and items in the YFC tent. We will be having an evening learning the basics of shearing, a cake decorating course, as well as a trip to Sheppys Cider. For any information about the Club, please contact Chairman James Westcott on 07850940132 or Secretary Michelle Batting on 07738114113.